It's been a couple of weeks since we checked in with our gently rotting friends over on Craig's desk. 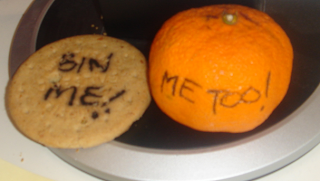 Things are getting pretty pongy now with the satsuma looking increasingly worse for wear. We're sort of hoping something ugly spits out of it soon, but no such luck yet. And we've discovered the most amazing thing: the digestive biscuit has gone hard. Now apparently this isn't supposed to happen. Biscuits are supposed to go soft with age, cakes go hard. I always knew, in my heart of hearts that this wasn't a simple time-wasting bit of blog-filler nonsense. We have a genuine scientific breakthrough on our hands. As I speak the planning discipline here is busy searching the information super highway, and a couple of the B-roads too, for the full SP on this amazing set of circumstances. Watch this space kind blog reader, watch this space.